If we go into the history of roof building, we will know that initially there were sod roofs or ones which were made from animal skins. But the problem with these roofs was the fact that they were not water proof and would allow entry of small animals into the huts. Later mud roofs came into fashion and it was a significant improvement from the ones which were prevalent. Next came the thatched roofs and the ones made of straw. The only reason they became popular was that they were an economical choice over others. Asphalt and metal roofs were the next stage in roof building where the construction costs were also low and it was a durable option. The next most important thing was fiberglass felt underlayment which not only provided protection but was also lightweight and hence did not add to the weight at all. Asphalt shingles with an apt slope of the roof was perfect for rainstorms but strong winds would make the water seep through the shingles and into the wooden panels underneath it. This would lead the wooden panels to swell up due to the dampness. Thus, new shingles were constructed which would provide protection for the wooden panels underneath. The modern technique of roof building has become extremely advanced and the concept of one design is suited to all is no longer applicable. There are different colors and designs of each roof depending upon the weather conditions and the various other aspects which goes into roof building. Light colored shingles are used for locations which are warmer so that the roof itself reflects maximum of the light. Warmer places have darker shingles to absorb the heat. Ballast roofing is also something which is quite popular. It not only goes a long way in the process of cooling but also reduces the cost of cooling. The most popular form of roofing is slate roofing. It is extremely durable and has longevity of almost hundred years. It is also waterproof and also resistant to fire damage. 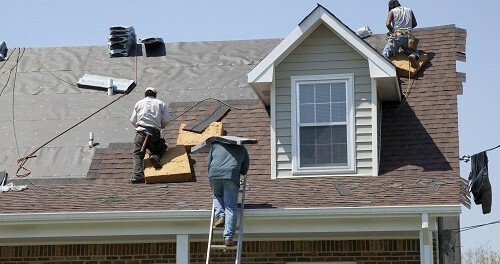 Most people prefer this type of roofing and it has been the popular choice since conventional times. But the thing about slate roofing is the fact that it might be slightly expensive and may become too heavy. Thus, making your roof out of slate would require you to take added support for the heavy weight of slate. Clay is another option for you especially if you are residing in a place where moulds and insects would be the primary problem. Hotter climates suit the clay roofing most. Clay roofing is fire proof but the construction of clay roofs is quite tedious and it becomes quite difficult for the roofers to build it. Clay roofs are also quite expensive and heavy and you will need extra support for the roofing. Metal is the other option that you might go for. The best thing about metal roofing is the fact that it is fire proof and is energy efficient and durable. It reflects all the heat and light which might enter the house or room keeping it absolutely cool. But it is not a good option for people to have metal roofs in areas which are cold. The most important thing is for you to understand which sort of roofing will be best for your house and accordingly get your roofing supplies and roofing materials. As the owner of the house, you should take professional help in deciding what type of roofing you need.